Boston, MA (July 2012) -- The 2011 Shirley Jackson Awards winners were announced on Sunday, July 15th 2012, at Readercon 23, Conference on Imaginative Literature, in Burlington, Massachusetts. Congratulations to all winners! A video of the awards ceremony can be viewed here (Credit: Phil Merkel). Previous years' winners can be found here: 2010, 2009, 2008, 2007. For some, the metaphor (a large title with includes not only traditional metaphor, but also simile and juxtaposition), is one of the defining qualities of poetry. Indeed, if one accuses or champions a prose writer or being "poetic," one of the first things they look at is the use of metaphor. Ideally, a metaphor has two parts, a tenor and a vehicle. The tenor is the thing being discussed, and the vehicle is the object of comparison. Now, a metaphor usually is considered a direct comparison, i.e., "All men are pigs," while a simile is considered an indirect comparison, "All men are like pigs," and a juxtaposition is a forced comparison, where men and pigs would be placed so close to each other as to draw a comparison. Also, one must consider descriptive metaphors, i.e., "Men root around in the slop of their troughs, waddling on four cloven hooves, their tusks piercing the mud of their styes..." where the description implies a pig without actually saying "pig". But this is the stuff of Intro to Poetry courses, readily available in any textbook. That being said, how exactly does a metaphor work? Most would argue that the vehicle should expose or open one's perception about the tenor. However, there are those who would argue that the vehicle also serves to limit or focus the tenor, exploring only particular aspects of the tenor which the poet wants to expose. 1) What is your favorite metaphor, from poetry, prose, film, speech, music, etc. 2) How do you think that metaphor works? "The Mississippi Delta was shining like a national guitar." This simile, from Paul Simon's "Graceland" is beautiful on many levels. First off, the tenor is rich with musical implication--blues, rock and roll, jazz, gospel, etc. The fact that the title of this song is "Graceland," with all of it's Elvis connotations, as well as religious connotations, compiles more layers of implication and depth onto the tenor. Then, Simon uses a strong verb--shining (connotations of light, sunrise or sunset, brilliance, etc.) --and a musical vehicle to strengthen and open up those musical and religious connotations. The guitar is an instrument, which is played. What does it mean, therefore, for a guitar to not sing or make music, but to shine? What sort of music carries that connotation of light, and how does it stem from or relate to the Mississippi Delta? Again, both the secular and religious music of the American South is brought into play, as well as the influence of all that music on Elvis Presley. Listening to the full song, one realizes that "Graceland" itself becomes a vehicle, and leaves Memphis and becomes literally a land of grace, and possibly redemption, for the speaker. So, what is your favorite metaphor and how does it work? Burning River will be closing it's open month submission contest July 31st at midnight. Judges, contest guidelines and terms listed at the site. Is Your Last Name Hill? So, apparently, if your last name is "Hill," you get an automatic pass for the Forward poetry prize. My question to readers of this blog is, has anyone read ANY of the books or authors listed? If so, what did you think? If not, have you even heard of them? I'm wondering if assignments aren't necessary. Pick five bloggers, have them each explore one of the nominees and go from there. Any takers? A reading not to be missed. 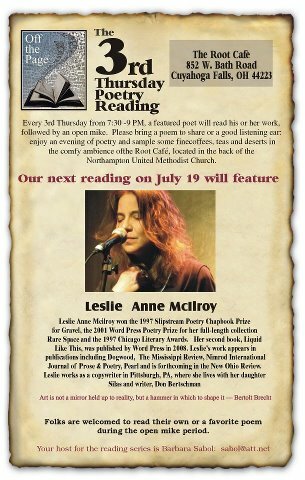 A rare Ohio appearance by a truly extraordinary poet and performer. I'm a proponent of workshops. 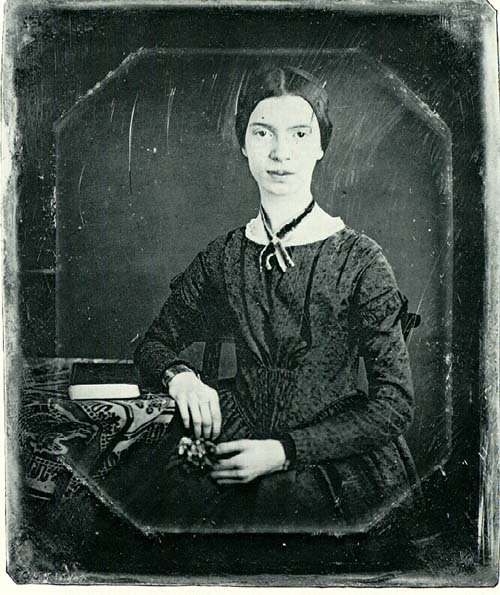 But I'm not sure that they're doing Emily Dickinson good in this critique. "I'd like to see you bring this through the workshop again." Always end with encouragement, that's it. "Almost all of your writing is about death. Could you lighten up? ...your self-esteem needs a boost. Have you thought about therapy, Em?" StarShipSofa is a science fiction podcast, but they also sometimes feature "Poetry Planet," edited by Diane Severson, a segment on speculative and science fiction poetry. Today's StarshipSofa features Poetry Planet number six, featuring poetry about the moon (and with a couple of my poems, including one of my haiku as the starting poem). (If you want to go directly to the poetry, it starts at 43 minutes in).